On Friday, November 29, Santa and Mrs. Claus will arrive at the downtown band shell as the village is lighted to begin the holiday season. Musical performances by local groups will precede his arrival and children are invited to meet with Santa from 6:00 to 8PM. The Helen Christmas Parade will wind through the town on December 14 beginning at 2:00 p.m. Located in the Downtown Marketplatz, Alpine Helen, GA. The Christkindlmarkt is a traditional German event that offers everything from unique Christmas gifts and decorations to an assortment of savory and sweet foods, drinks and candied treats. View the beautifully decorated trees and wreaths. Trees and wreaths are available for bid. This event is held each year to raise money for United Way of White County. The trees are awarded to the highest bidders at 2PM on December 7. What is Fasching ? It is pre-Lenten festivities celebrated in grand style in mostly the predominantly catholic regions of the German-speaking countries. The Rhineland has itsKarneval, Austria, Bavaria and Berlin calls theirs Fasching, and the German Swiss celebrate Fastnacht. When is Fasching Celebrated? Officially begins in most regions in Germany on the eleventh of November at 11:11 am or the day after Dreikönigstag, so on January 7th. The big bash celebrations are however not on the same given date each year, instead the date varies depending on when Easter is held.Fasching culminates into Fasching week which begins the week before Ash Wednesday. Weiberfastnacht - Thursday before Ash Wednesday. This is mainly an event held in the Rhineland. The day begins with women storming into and symbolically taking over city hall. Then, women thoughout the day will snip off men's ties and kiss any man that passes their way. The day ends with people going to local venues and bars in costume. Parties, Celebrations and Parades - People will celebrate in costume at various carnival community events and individual parties. Carnival parades abound, it is literally the weekend for people to live it up. Rosenmontag - The largest and most popular carnival parades take place on the Monday before Ash Wednesday. 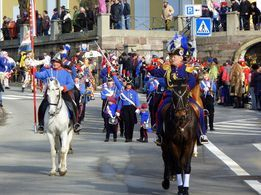 These parades come mostly from the Rhineland region. People throughout the German-speaking countries will tune in to watch the biggest German carnival parade of all which is held in Cologne. Fastnachtsdienstag - Besides some parades which are held on this day, you have the burial or burning of the Nubbel. A Nubbel is a life-size doll made of straw that embodies all of the sins committed during carnival season. It is buried or burned with great ceremony on Tuesday evening before everyone partys one more time till Ash Wednesday arrives. CELEBRATING IN HELEN: There are several parties and festivities that take place during the month of February. The second weekend in February you can join in the icy fun on the river as a group of Fasching enthusiast march through town in a parade, along the way enjoying spirits to warm their bodies for the river float parade. Last year there were over 100 participants. Contact us for more info. You can also take part in any of the many parties offered around town by local hotels/restaurants. Celebrate Mardi Gras "Bavarian" Style at Fasching. Although Helen's Fasching is on a much smaller scale than Germany, it is a great time of celebration. Dress as your favorite character or personality or or least favorite and join in on celebration with music, dancing, and fun.